A close relation to Hazels and Cob nuts, the Filbert is generally larger and tastier than both. 'Cosford' is a reliable variety producing filbert nuts with a long husk or beard. The nuts can be eaten green when they have a delicate flavour or stored through the winter. A pollinator is required, another variety of filbert, any hazelnut or cob will pollinate, even the native hazel ‘Corylus avellana’ is a suitable pollinator and is often found in native hedgerows. 'Cosford' wiill tolerate some shade and grows well on any well drained soil out of exposure. Attractive catkins provide winter interest. 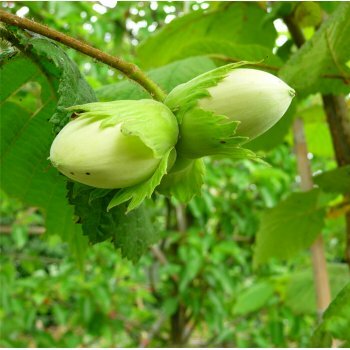 View all edible nut trees.